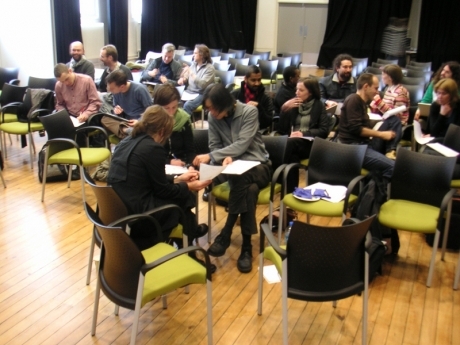 Culture Lab, Research Practice Seminar, 2010. This two-day research-training event explored current design and curating practice research, and embraced new alternate models of creative production and dissemination. A collaboration between Culture Lab, Newcastle University and CRUMB at the University of Sunderland. With participation from Kitchen Budapest; UDK Berlin Art & Design students; University of Dundee School of Design; and Social Inclusion through the Digital Economy researchers. The aim of the event was to bring together post-graduate students of digital media art practice and curating with specialists in the field in order to share research methodologies and enhance the level of cross disciplinary understanding. Speakers included: Tatiana Bazzichelli (IT/DK) a communication sociologist, researching network culture, hacktivism and net art and author of Networking. The Net as Artwork; Clive Gillman (UK) artist and Director of Dundee Contemporary Arts; Sabine Himmelsbach (DE) Artistic Director of Edith Russ Site for Media Art, Oldenburg, Germany; Brandon LaBelle (DE/US) artist and writer working with sound and the specifics of location and author of Acoustic Territories: Sound Culture and Everyday Life; Shintaro Miyazaki (DE) media theorist, curator and artist; Jon Rogers (UK) product designer working on Innovative Product Design at the University of Dundee; Kate Southworth (UK) artist and also leads the iRes Research Group in Network Art at University College Falmouth; Tom Schofield (UK) artist who works with technology at Culture Lab in Newcastle. There were also contributions from Newcastle and Sunderland Universities staff: Jamie Allen, Sarah Cook, Areti Galani, Verina Gfader, Beryl Graham, Lalya Gaye, Jo Kazuhiro, and Atau Tanaka. A collaboration between Culture Lab and CRUMB. Funded by The Arts and Humanities Research Council, University of Sunderland.